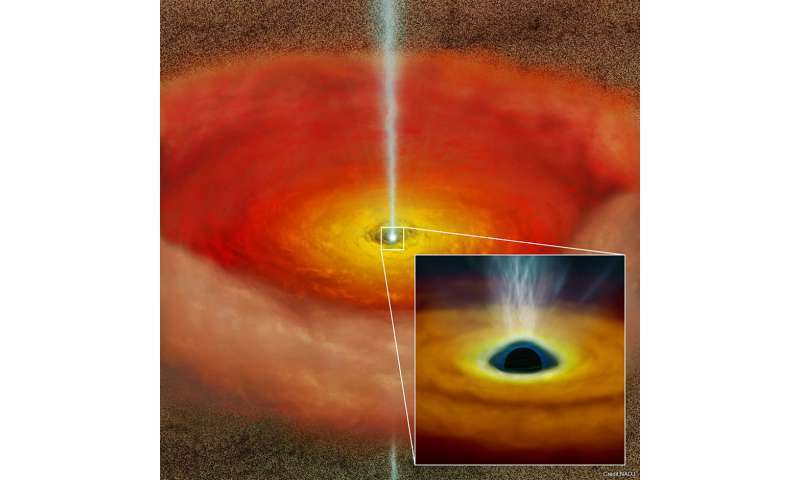 Statistical analysis of supermassive black holes suggests that the spin of the black hole may play a role in the generation of powerful high-speed jets blasting radio waves and other radiation across the universe. Black holes absorb light and all other forms of radiation, making them impossible to detect directly. But the effects of black holes, in particular accretion disks where matter is shredded and superheated as it spirals down into the black hole, can release enormous amounts of energy. The accretion disks around supermassive black holes (black holes with masses millions of times that of the sun) are some of the brightest objects in the universe. These objects are called "quasi-stellar radio sources" or "quasars," but actually this is a misnomer; only about 10% of quasars emit strong radio waves. We now know that "radio loud" quasars occur when a fraction of the matter in the accretion disk avoids the final fate of falling into the black hole and comes blasting back out into space in high-speed jets emitted from the poles of the black hole. But we still don't understand why jets form some times and not other times. A team led by Dr. Andreas Schulze at the National Astronomical Observatory of Japan investigated the possibility that the spin of the supermassive black hole might play a role in determining if the high-speed jets form. Because black holes cannot be observed directly, Schulze's team instead measured emissions from oxygen ions [O III] around the black hole and accretion disk to determine the radiative efficiency; i.e. how much energy matter releases as it falls into the black hole. From the radiative efficiency they were able to calculate the spin of the black hole at the center. By analyzing nearly 8000 quasars from the Sloan Digital Sky Survey, Schulze's team found that on average the O III oxygen emissions are 1.5 times stronger in radio loud quasars than in radio quiet quasars. This implies that spin is an important factor in the generation of jets. Schulze cautions, "Our approach, like others, relies on a number of key assumptions. Our results certainly don't mean that spin must be the only factor for differentiation between radio-loud and radio-quiet quasars. The results do suggest, however, that we shouldn't count spin out of the game. It might be determining the loudness of these distant accreting monsters." These results were published as "Evidence for Higher Black Hole Spin in Radio-loud Quasars" by Schulze, et. al. in the Astrophysical Journal in November 2017. The plasma ignoramuses knowledge of real plasma physics is truly a pathetic display. All they really have is a bunch of mindless pseudoscientific mumbo jumbo conjured up into mathematical constructs with no physical meaning. And the pseudo-sci-fi crowd eats it up like the religious acolytes that they are.